A fabulous historical place counted as one of the best things to do in Bidar, Karnataka, the Bidar Fort is a plethora of historical facts. The architecture itself is very mesmerizing with its oink stones against a backdrop of the bleus sky and lush green vegetation, depending on the time of the year you are visiting. It was built in order to accommodate the new capital of Sultan Alla-Ud Din Bahman. The fort further houses thirty more monuments. An iconic monument that is a must-visit while in Bidar! Want to plan a DIY trip? Use Bidar trip planner for the same. Book perfect hotels in Bidar like Blackbuck Resort. There are plenty of ready-to-book Bidar vacation packages available that will cover the major attractions, accommodation concerns including the prime one like how to reach Bidar. Love this? 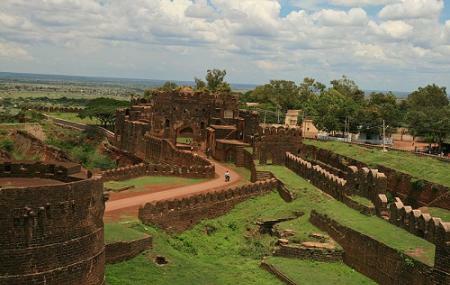 Explore the entire list of places to visit in Bidar before you plan your trip. Fancy a good night's sleep after a tiring day? Check out where to stay in Bidar and book an accommodation of your choice. One of the better forts. Well constructed , we'll preserved. Super landscapes. Moats are high and built strategically. The buildings which are inside, allowed access only if you can name residents or temple you want to visit have their own charm. The farms inside, Ashram/temple and temple are good too. Visit other places too to know the past grandeur of the old city. I spent a peaceful time as there was absolutely fresh air due to the garden and the weather was quite good . Only if we could take our bikes inside the fort then it would be even better . The maintenance was nice and clean but there was no cafeteria even though there was a dedicated place for it. Kids would enjoy this place if they like to run around freely . Anyway the parking maintenance could be a lot better as there was no security over there and no proper road to park the vehicles. I was so fortunate to visit such a beautiful historical monument. I felt as if i was back in the past. Even though i was a rising a motobike, i felt as if i was on a horse riding through the gates and arches of the fort. It made me feel like a king. Beautiful experience. One of several Heritage places to visit in Bidar... The Bidar fort is a specimen of the Persian architectural style having 1.21 km in length and 0.80 km in breadth, with a quadrangular layout. Surrounded by three miles long walls and comprising 37 bastions, it is surrounded by a triple moat. Nice experience. Good views of the fort with city and ruins. Very easily accessible from roads. Sufficient parking space for visitors vehicles. Entry is free for visitors. Though most of the fort is closed permanently so we can roam around in the garden areas and at the gates. Photography is completely allowed. It has a museum. Again free visit and no photos allowed. Usually it will take around 1-2 hrs to visit with photos. Better time to visit is early in morning. Fort closes by 5 p.m.